This afternoon, just after lunch, Adam decided to bake bread rolls. I do like that he’s impulsive sometimes but it would be nice if he didn’t so frequently decide that he can do something in x minutes when in actual fact it is going to take x minutes + 1 hour. Anyway, Tom had a great time helping to make the rolls so it was totally worth it! The bread rolls came with us to the beach, filling the car with the scent of freshly baked bread for the 40 minute drive. I completely failed to take a photo of them because we were in a hurry to get going once they were cooked and by the time we were sitting around the picnic table with dinner laid out before us everyone was way too hungry to allow for such frivolities as blog photography. 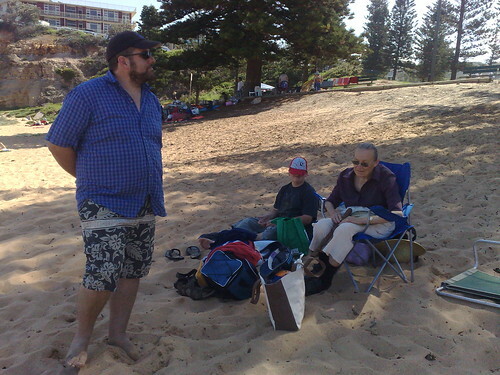 We took both Adam’s and my mum along with us and, when we arrived at Avalon beach, were able to plonk ourselves down in the shade of one of the huge pine trees that overlook the sand. Sunscreen was applied and Tom, Caitlin and Grandma made a bee-line for the water. David had decided that being sandy and salty was over-rated and settled down to sit with Nan. David has engaged his anti-camera device. 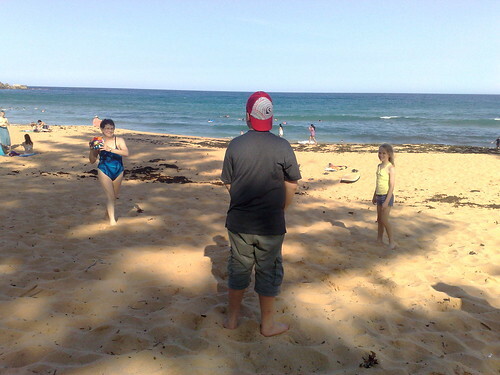 Adam and I wandered down to the water’s edge and stood knee deep in the waves watching the kids in the water with my mum. We ended up staying there, talking about stuff, with only the occasional larger wave interrupting us, for most of an hour. It was probably the best conversation time we’ve had in weeks. Eventually we thought we’d better go back and be friendly to Nan and Dave. A little later Adam and Tom headed over to the ocean pool and Dave and I followed. 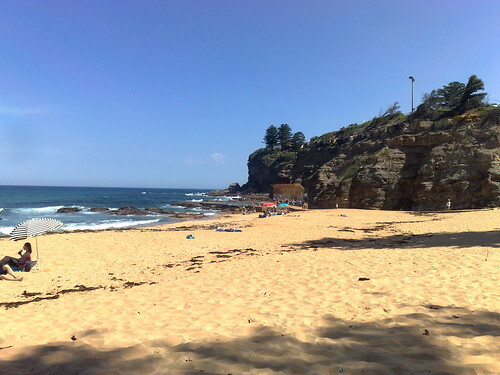 The ocean pool is down where the sand meets the rocks at the base of the headland. Ha! Got him before he could engage anti-camera device! I was planning on just walking in far enough to get the sand out of the legs of my boardies but ended up going in for a swim after all, the water was just too enticing. We swam over to the edge where the waves of the incoming tide were just beginning to slosh over the concrete wall and rested there watching the surf break on the rocks. I’d have taken some photos but my camera was in David’s pocket and he’d got fed up with watching us in the pool and had buggered off back to our spot on the beach. 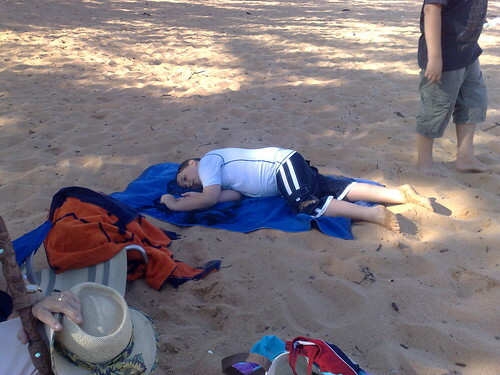 After all that swimming and walking over soft sand and floating in the pool Tom was exhausted. Grandma, David and Caitlin, however, were still going strong. It was clearly an ice cream kind of day. That sky! That water! OMG…. warmth! It might snow in Florida today. So if you don't mind, I'm hopping a jet and coming right over for freshly baked bread rolls and a slosh in the ocean. Is the water warm? I do love me some warm ocean water. But preferably without sharks. And seeing as how Australia is the headquarters for Great White's, I might just have to cool off in the ocean pool instead. I know I'm not quite as beefy as I used to be, but I'm "Delicious." Braja told me so! Awesome post Mim. You truly made me wish I were there! What a wonderful day for the family! That first pic- what a beautiful spot! Love Dave's 'anti camera device'. Love Tom's comment about the ice-cream. That is a great way to finish off time at the beach. And your photos are gorgeous. Sounds and looks like you all had a fabulous time. Pea green with envy! What a lovely day – could you send one of them here? I spent the last 2 days painting the fence in the sun. Now that I have finished I woke up today and it is rainy and windy. Bah humbug! Just when a trip to the beach would be nice. I'm happy for you, but a little bit jealous. 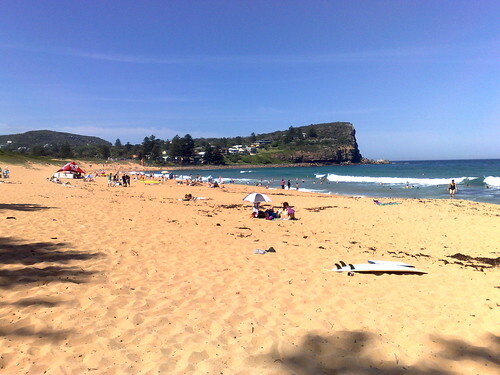 @Liz – we do have some gorgeous beaches in Sydney and we don't get to them nearly often enough. Adam asked Tom if we should do it every weekend – he was all for it! @Cathy – Tom remembered getting ice-cream the last time we were at Avalon, which I'm pretty sure was about 3 years ago! @Mel – Bummer 🙁 You deserve beach after all that painting. Anti-camera device – how funny! 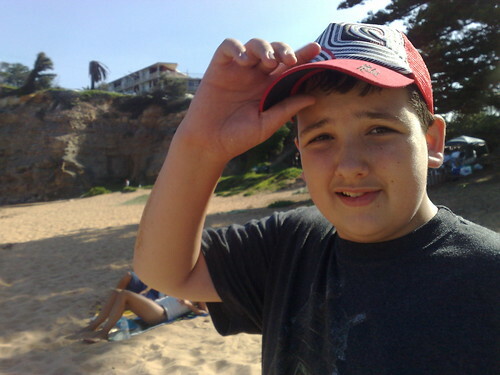 That beach looks so lovely as I sit here with -18 deg. C weather outside..brrr! and ice cream is essential. If you could… swing by Monday… have a little something for you! As you should! What is a day at the beach without ice-cream.